Union Pacific has two theater inspection cars in its current heritage fleet of passenger cars. The 'Fox River' and 'Idaho' are produced in brass but no one produces the cars within my budget. After talking with an eBay member by the username of mrw87 after purchasing some decals, he told me he had a friend who was making car sides for the theater cars. I ordered one set for each car and here is the result. 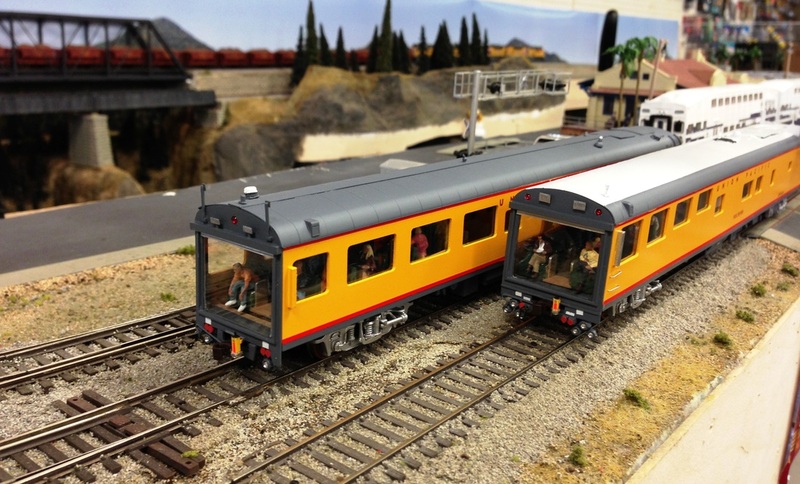 I took two Walthers sleeper cars to use for the framework. I tried to match the prototype underbody detail using Train Station Products parts. The roofs we detailed using plastic strips and brass pieces. The interior was kitbashed to match the drawings Union Pacific has on its website. The window ends were made using a Train Stations Products end, MV lenses, Details West headlights, and a scratch built end of train device.